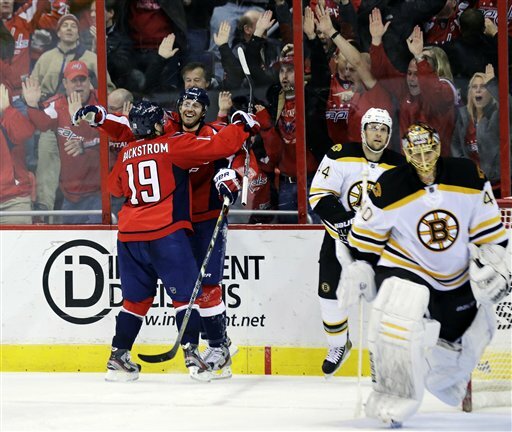 WASHINGTON (AP) — Eric Fehr scored 37 seconds into overtime Tuesday night, and the Washington Capitals rallied from a three-goal, first-period deficit to beat the Boston Bruins 4-3 in a thriller reminiscent of the teams’ seven-game playoff series a year ago. Pinched by two defenders, Fehr was falling forward as he got off the shot that hit the upper right post and went in, giving the Capitals their seventh win in 10 games as they attempt to climb out of the lower echelons of the NHL standings. Wojtek Wolski and Mike Ribeiro also scored, and Tomas Kundratek got his first NHL goal for the Bruins. A short-handed penalty shot by Brad Marchand, an even-strength goal by Zdeno Chara and a power-play tally from Dougie Hamilton gave Boston a 3-0 lead in the first period.